Confession: I’m a digger. Give me a pint of cookie dough ice cream and I will inadvertently eat the entire container as I dig and search for those luscious little bits of cookie dough. Just one more bite always uncovers the hint of another piece. So, I dig and eat and work with the patience of an archeologist at an excavation site, gently removing each glorious piece of cookie dough. I get lost in my work, until suddenly I’m holding an empty container. I feel both ashamed and proud simultaneously. I’m a digger. So, you may imagine the little problem I had with those brownies I recently shared with you; the ones I so cleverly filled with bits of halloween candy; those bits of halloween candy which taunted me into consuming bite after bite after bite of chewy, fudgey brownies. I would have stopped. Really, I would have. But then I’d catch a glimpse of something; a piece of Twix, perhaps. One more bite. But wait…what’s that? Gooey, melted Reese’s Peanut Butter Cup, behind which hid a few caramel-coated peanuts; remnants of a chunk of Snickers. And that’s how the brownies disappeared, one focused bite at a time.The baby in my belly is most thankful for the sweet treat. But this post isn’t about my small digging problem. Though it is about sweets; sweet, sweet, sweet potatoes. With Thanksgiving fast approaching, I’ve got sweet potatoes on the brain. And my brain was convinced that it was the perfect time for a spicy sweet potato bisque. I know. You’re probably thinking that this girl sure makes a lot of soups for someone who claims to be largely indifferent to soups. Perhaps I enjoy soup even more than I realize. When it comes to creamy, bisque-style soups, I’ve got a little weakness for serving them with a bit of fresh seafood showcased in the center. (See my recipe for Chilled Avocado Soup and Crab Cake with Chipotle Remoulade.) A bit of crunch in the form of crispy bacon, croutons, seeds or nuts never hurts too. These little touches of flavor and texture turn a simple bisque into a simply elegant meal. 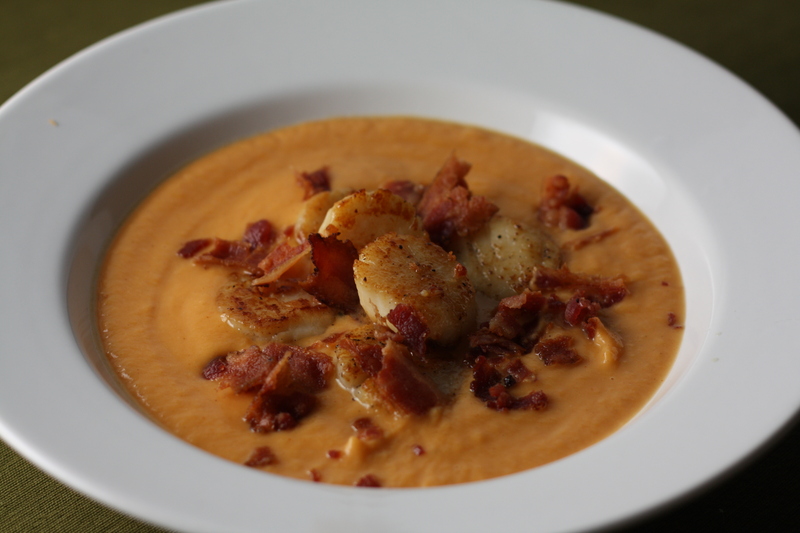 I’m pairing my sweet potato bisque with a few seared sea scallops and some crispy applewood-smoked bacon for a fantastic autumn meal. *If available, I recommend using applewood smoked bacon. It’s nitrate free and the flavor is fantastic. Preheat oven to 375 degrees. Wash the sweet potatoes and pierce the skin several times with a fork. 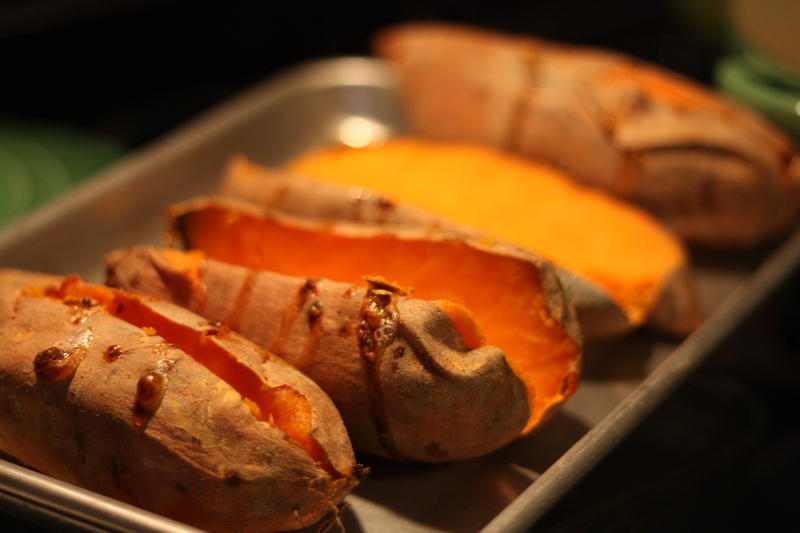 Place the sweet potatoes on a baking sheet and bake for about 90 minutes until fork-tender. Remove from the oven and allow to cool. In a large wide-bottomed saucepan or stockpot, cook the bacon over medium heat until crispy. Remove the bacon and set aside for garnishing the soup. Pour off all but about 2 tablespoons of the bacon grease. Add the onion and garlic to the bacon grease and cook for about 5 minutes until the onions are tender and slightly translucent. When the potatoes are cool enough to handle, scoop out the sweet potato and add it to the pan. Discard the skins. Add the chicken broth. Simmer the sweet potatoes in the broth for a few minutes. Then, allow the mixture to cool slightly. Blend the mixture until completely smooth. (An immersion blender is the most convenient tool for the job, but a regular blender or food processor will work fine. Just be careful when transferring the warm mixture to a blender or food processor.) Return the blended mixture to the saucepan. Add the half and half and stir until well blended. Add the salt and seasonings. Taste and adjust seasoning as desired. Serve warm. Note: Depending on the size of the sweet potatoes and your desired soup consistency, you may need to add more or less chicken broth and half and half. For the Pan-Seared Scallops: To cook the scallops, heat 2-3 tablespoons of olive oil in a pan over medium to medium-high heat. Pat the scallops dry and season with a little salt. (About a pound of scallops will serve four people.) Place the scallops in the pan. Let them cook for about 2-3 minutes, without disturbing. Once they’ve formed a golden-brown crust, turn the scallops over. Cook for another 2-3 minutes on the other side, or until fully cooked through. Cooking time will vary depending on the size of the scallops. To Serve: Pour some of the warm soup into a wide bowl. It shouldn’t be too deep. 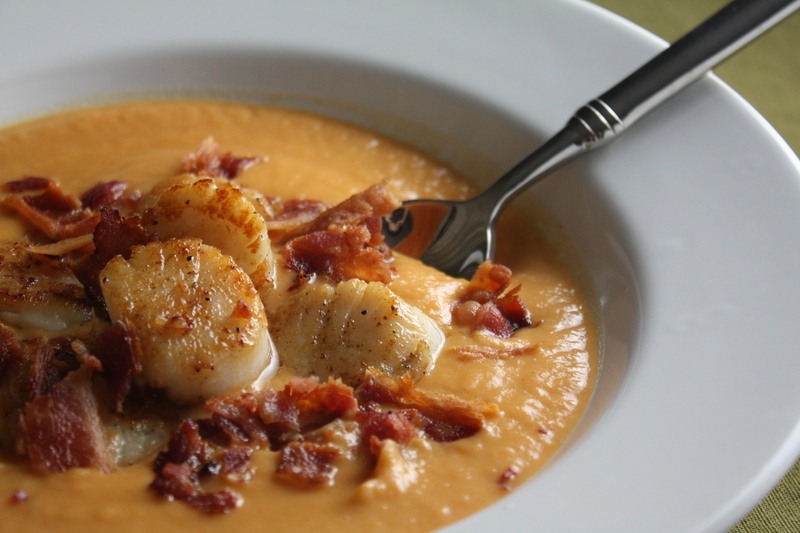 Place several seared scallops in the center of the soup. Top with the crispy bacon reserved from the soup. Posted in Appetizers, Food, Main Course, Recipes, Seafood, Side Dishes, Vegetable and tagged autumn, bacon, Cooking, Eating, fall, Food, food photography, pregnancy, Recipes, scallops, seafood, soup, sweet potatoes, Thanksgiving, vegetables. Bookmark the permalink. What a perfect bisque. I have already put sweet potatoes onto the grocery list so I can make this this week. Yummy. 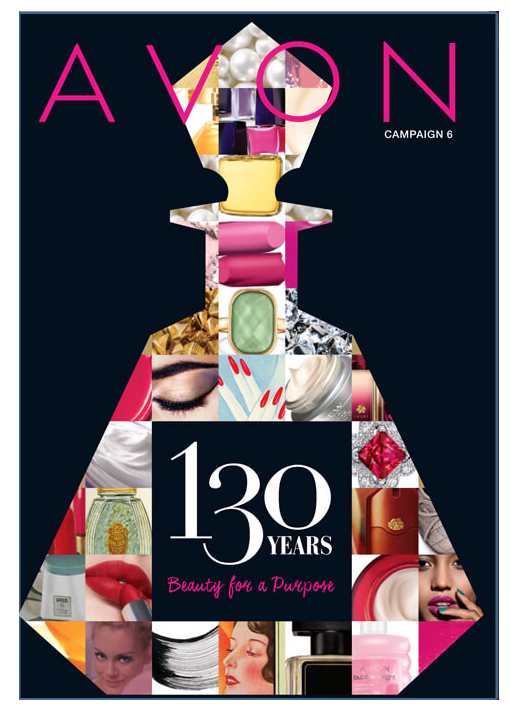 Wow, this looks amazing!!! I cannot wait to try. What a creative recipe! I love every single ingredient you used! I made this tonight-very good. The only change was that I cooked the potatoes yesterday-they were fine in the fridge -just cut them in small pieces when I added them to the pot. I made your apple crisp yesterday–so room in the oven for the potatoes – The apple crisp was also good-and it was good when someone brought it to our book club.